This album spread captures a sequence of candid photos of the bride and her son taken during her Black Creek Pioneer Village wedding. The first image, capture fairly early on the big day features the bride and her son looking at the camera. While I am not crazy about traditional shots, they are essential in documenting the wedding day. The mother and her son are hugging and are looking at the camera, undoubtedly happy to be together. The next image showcases the bride kissing her son on the forehead. Although it was a staged shot, both have their eyes closed, which proves they were enjoying the moment before mom was heading to the venue for her wedding ceremony. 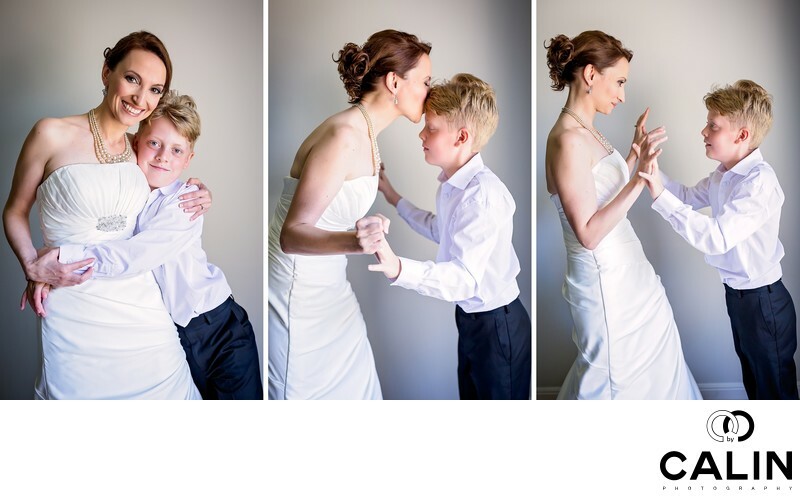 Finally, the third image shows a playful bride interacting with her son. Admittedly, these classic wedding photos will not win awards. Still, for the family, they are the most beautiful images they have together and are worth a fortune. Wedding photography is not about pretty pictures of the banquet hall, or posed images of the bride and groom at various gardens and locations. Sometimes the the couple and the guests' emotions explode during the wedding ceremony and reception and that is the essence of wedding photography. Often I see brides obsessing on their wedding day about banquet hall decor and instead of enjoying the time with the family and guests. For all my Toronto weddings I have an in person consultation at the venue before the couple's big day. This is a perfect opportunity to visit the wedding venue, to discuss and plan the events including the photo session. We also visit any gardens or historical buildings that could provide the backdrops for beautiful wedding photography and inquire about photo permits. It is very important to know that many locations in Toronto Ontario require a wedding photography permit. That also applies to engagement photo sessions. Often, during the wedding reception we do a quick night photo session and a during the consultation we discuss it. Finally, if the bride and groom are planning a choreographed first dance, we go to the dance floor so they can show me their moves.